What's a boat got to do with Class 40's - well nothing really except this particular vessel was approaching the loading stage at Llanddulas on this grey, wet, windy morning and I "shot" it while waiting for D345 to appear. 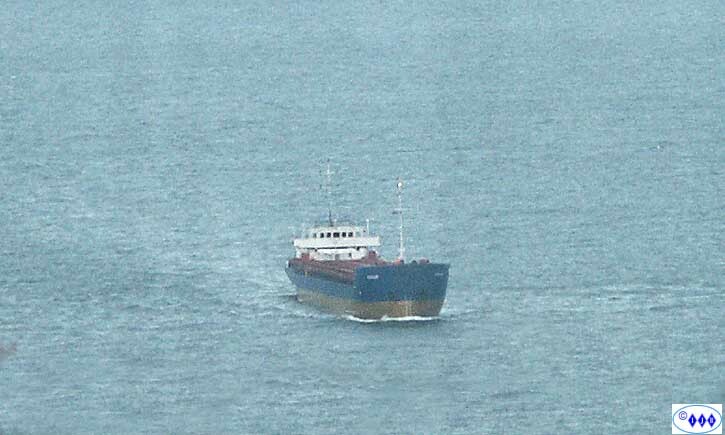 The boat loads with stone from the Llanddulas quarry for shipment to various destinations. 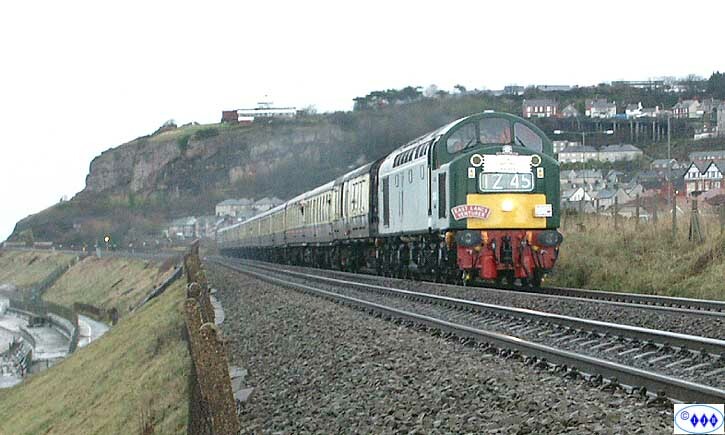 The restored Class 40 number 40145/D345 heading towards Colwyn Bay en route for Holyhead. 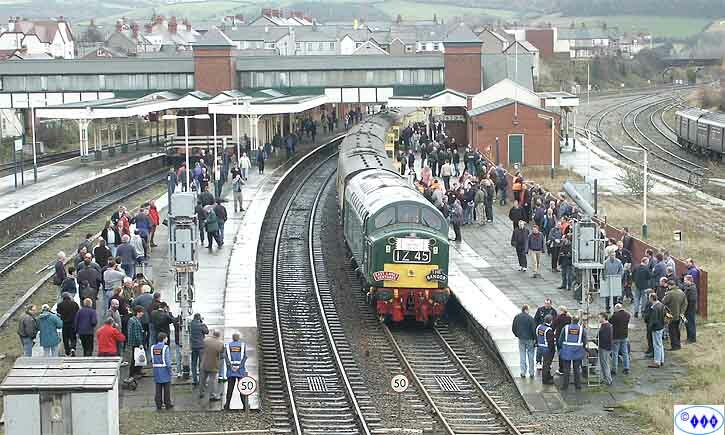 The wait at Llandudno Junction allowed me to photograph the engine at various locations so after Colwyn Bay came the Junction. As is now usual on these occasions the overbridge was packed solid with enthusiasts and sightseers just wanting to know what the fuss was about - the lack of proper footpaths on this bridge makes it positively dangerous. 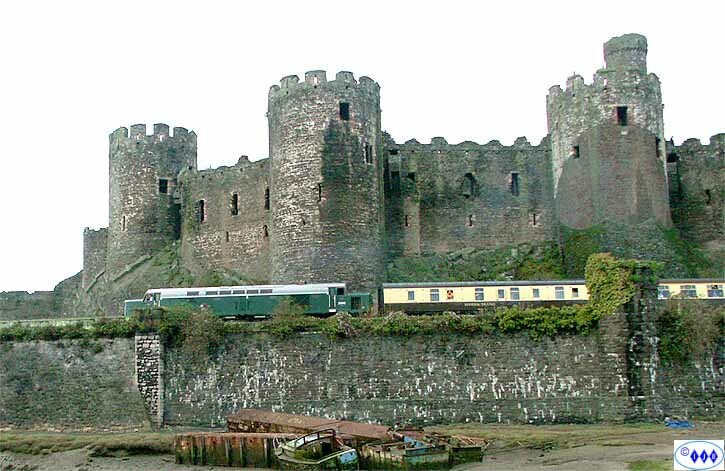 On now to one of my favourite spots by Conwy Castle and the appearance of FNW's Birmingham-Holyhead service with 47786 "Roy Castle OBE" in charge. 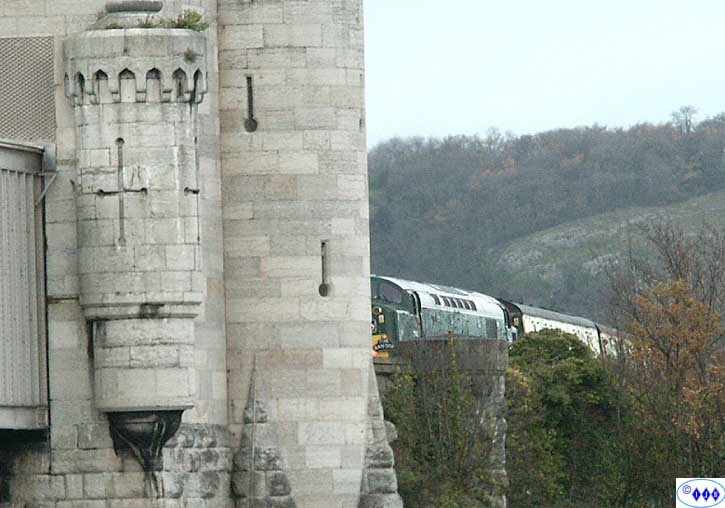 This locomotive happened to pick one of the few moments of sunshine as it passes by the Castle ramparts. 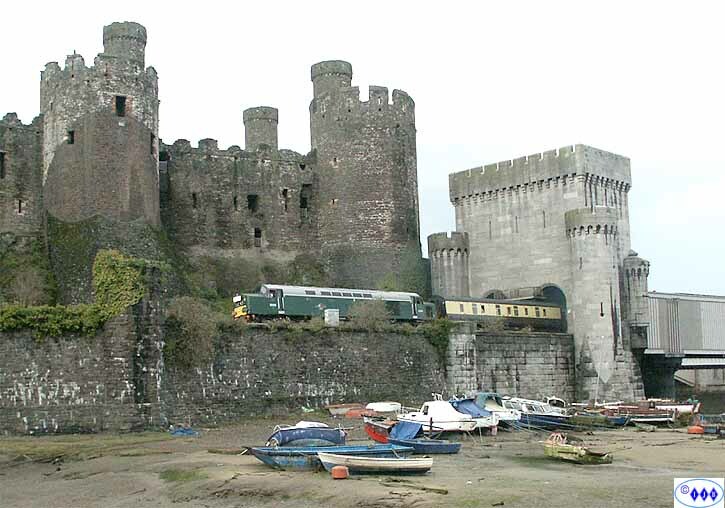 Several minutes later the "whistler" could be heard quietly approaching the Conwy tubular bridge/tunnel(?) and slowly crept into view where it stopped just short of the entrance. The characteristic whistling continued while one of the cab members phoned in for clearance and a few minutes later it was off. There was the usual warning hoot on the two-tones and a gentle rumbling as the train entered the down tube. 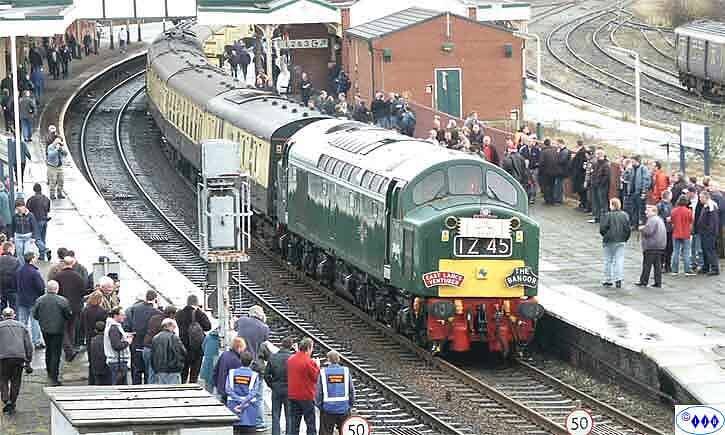 The speed limit round the castle is fairly restricted so there was no massive burst of power but nonetheless it was impressive in both sight and sound as the packed train leaned into the curve on its journey round the castle walls. 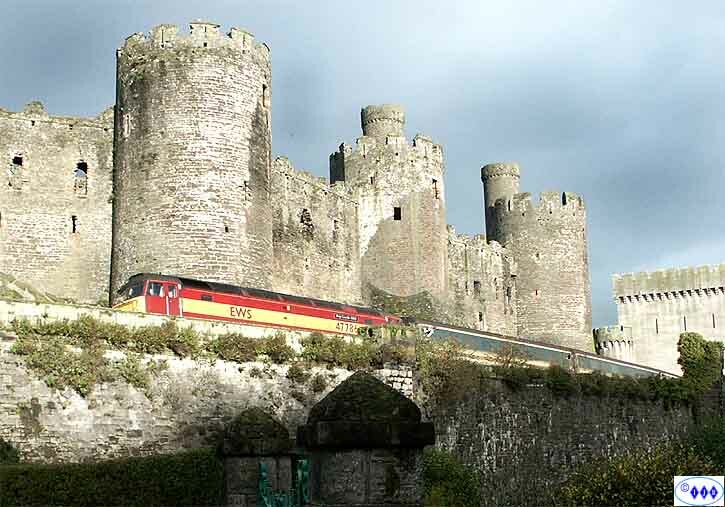 The train continued towards Conwy station and, despite the inclement conditions, it was well worth the wait. Grateful thanks go to all those concerned with organising the tour. 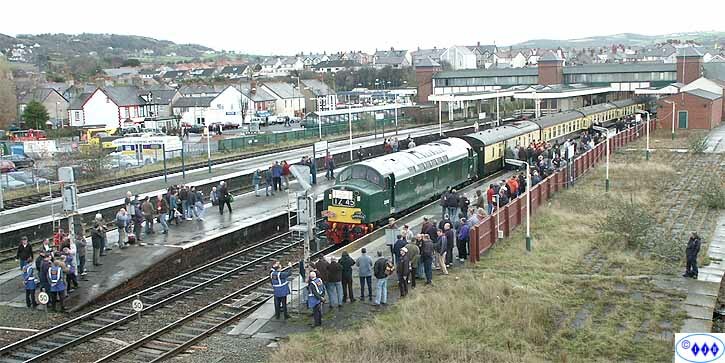 More great shots of this event can be seen on Charlie Hulme's North Wales Coast Railway.